The coming of Spring brings about the coming of the Arts Festival that happens annually here at RHS. 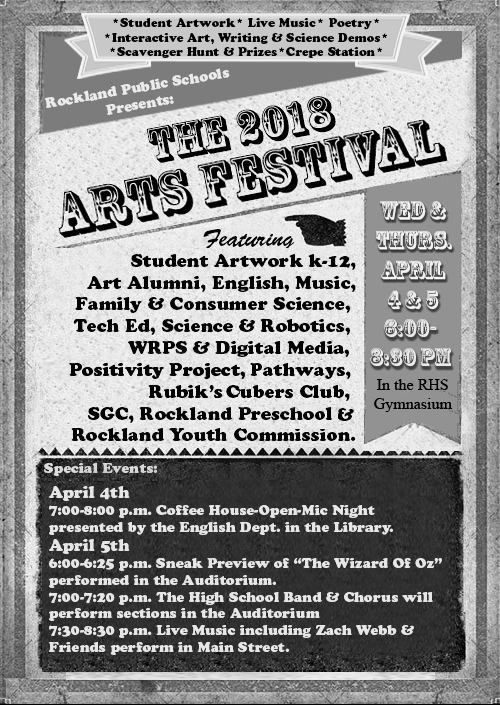 This year, the Arts Festival will be presented in the RHS Gym on April 4 and 5 from 6-8:30 pm. The event is held yearly to show off the artistic talent present in the Rockland Schools. Be sure to stop by to see artwork, music, and poetry that is created in Rockland. This year promises to have something for everyone with a Coffee House-Open Mic on Weds. from 7 to 8 in the library, and a sneak preview of the Wizard of Oz in the auditorium on Thurs. night from 6 – 6:25. This is in addition to the great artwork of students from Preschool to Grade 12 in the gym on both nights along with exhibits from the Science, Technology, Family and Consumer Science classes. Here is a link to our coverage of last year’s Arts Festival. Rebekah Panaro speaks about student involvement. Ronan McNally encourages students to register or pre-register to vote. Katie Houde reads her poem “Bullet Proof Teen”. On Thursday, March 15, RHS held a student-driven walkout in memoriam of the 17 lives lost in the Stoneman Douglas High School shooting in Parkland, FL. on Feb. 14. During the first part of the 17 minute walkout, the approximately 300 students who gathered outside the west entrance of RHS stood in silence as senior Hannah Murphy read the name of each of the lives lost in Parkland. Speakers and organizers of the event included: Megan Diver, Katie Houde, Kerin Dalton, Rebekah Panaro, Ronan McNally, Hannah Murphy and Michelle Ramoska. Diver introduced each speaker and thanked students and faculty who supported the event. Houde read her poem “Bullet Proof Teen,” Dalton read her statement about student involvement against gun violence, McNally and Panaro encouraged students to continue their activism by registering to vote and by participating in the nationwide March 24 student protest that will be held on Boston Common. After the walkout, Mr. Harrison, principal of RHS, said that he thought it went very well, and he commended the organizers and all the students who participated. Following the rally, students were able to register and pre-register to vote in the cafeteria during lunch. Check back to the Veritas website for our video interviews with Megan Diver, Katie Houde, Officer Ethan Schnabel and Mr. Harrison. Eighteen Rockland High School students traveled to , Guatemala on Saturday, Feb 17 to Saturday, Feb. 24. The students and staff went to help Worthy Village organization volunteers to implement clean water, health, and hygiene programs for the poor, indigenous people of rural Guatemala. Junior Ashley Murphy was one of the eighteen who went and Veritas reporters, Haiden Fiore and Emily Marquis interviewed her before and after the trip as seen in the video below. Helping villagers with water filters.